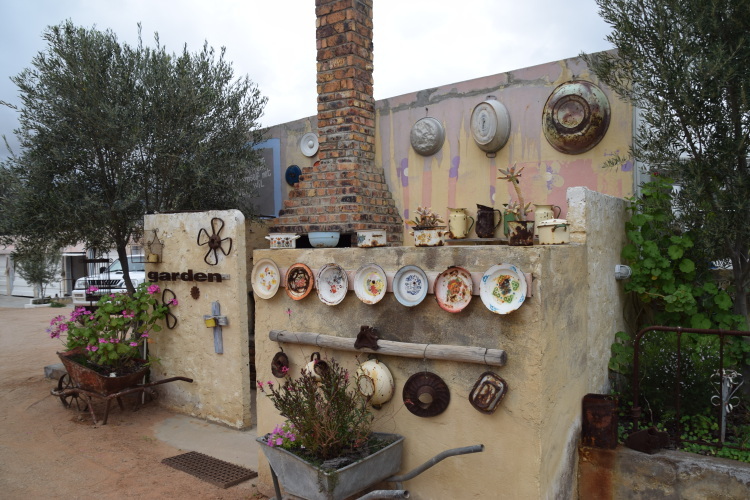 Travelling through the North Western Cape has been like a trip down memory lane. Not that I’m suggesting the people and places are in any way ‘behind the times’ – not at all. It’s just that they have retained the history and traditions that I left behind 40 or 50 years ago. 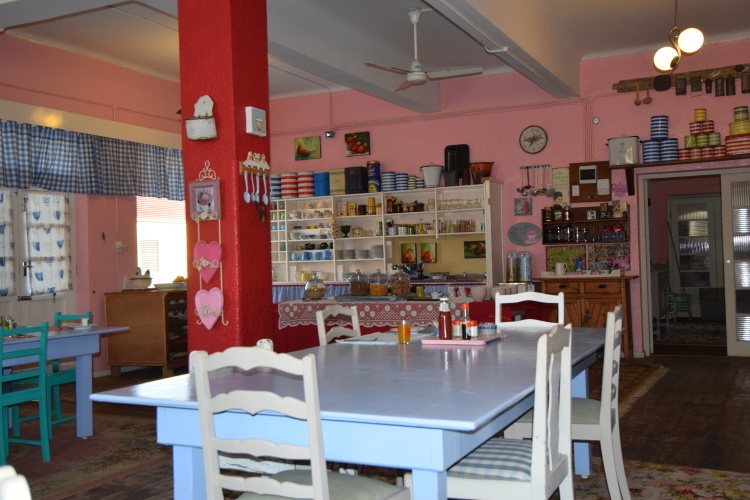 Tuis-nywerheid (home industries) stores in every small outpost, stacked chockablock with goodies that Ouma used to make – vetkoek, koeksisters, melktert, soetkoekies, beskuit in half a dozen varieties… Not to mention the knitting, crocheted doilies and covered coat hangers! 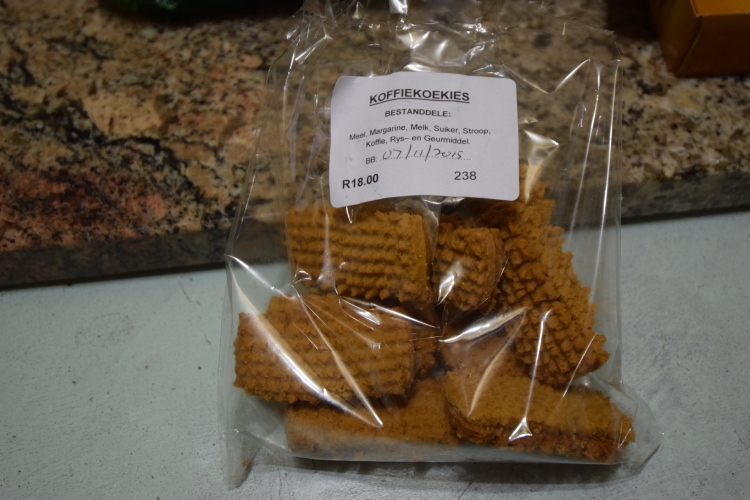 I even have become adept at ordering my wortelkoek in Afrikaans. Peter, surprisingly, has become heeltemal tweetalig… Falling easily into a conversation in Afrikaans with the garage attendant a few days back about the stukkende wiel! People are genuinely amazed when we progress beyond “baie dankie”, leading to all sorts of questions about us and our lives. Genuine interest from lovely people. 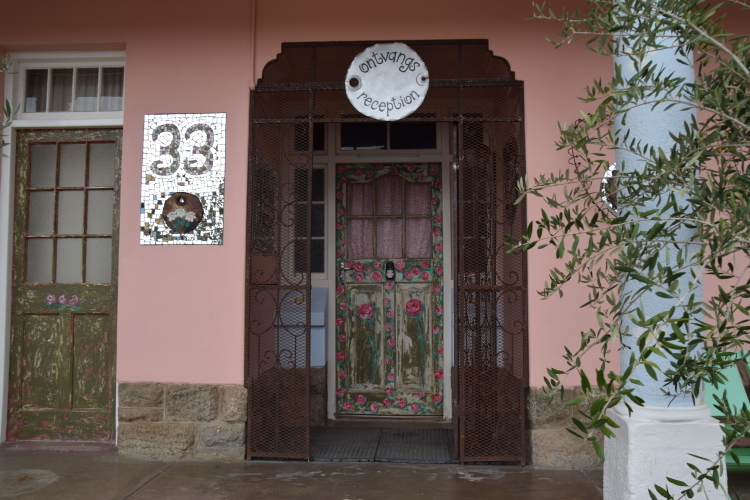 Our two nights in the Sophia Guesthouse in Garies did not disappoint.- though it was not without a few shocks (from the shower taps, real electric shocks!). With no electrician in town, I was vaguely tempted to “phone a friend” – I mean, I do know a couple of electrical workers- but in the end we just reported the fault, and used a hand towel to turn the taps on and off! 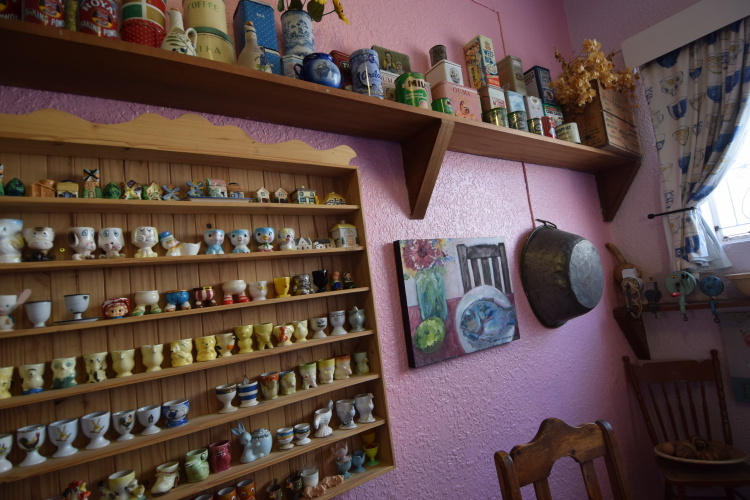 The place itself was like the Kingdom of knickknackery, from the front door to the bathroom and beyond, run by the generous, bustling Elizna – a refugee from Johannesburg – who has clearly found a home for her vast collection of egg cups, teapots, flower bowls and general whatnots. Despite being the “self-catering” cottage, there was a full English breakfast every morning, and on the second night she announced they were cooking “lamb kerrie” for dinner, if we would like some served in the cottage. It came complete with peaches, jelly and custard for dessert – a long time since I’ve seen jelly made with ideal milk! And yes, I was the annoying foreign person who scoured the store shelves of Garies for butter – and no, sorry people, but margarine is NOT butter! They have spreadable margarine, baking margarine, low fat margarine… But definitely no “egte botter”! From there it was on to Clanwilliam – over the scenic route across the Cedarberg. Another day of hindsight pronouncing that we should have hired a 4WD vehicle! Two unexpected and special treats awaited – first our host who turned out to be an amazing quilt artist – check out http://www.enidviljoenquilts.jimdo.com – besides running a really lovely B&B. We loved the quilts so much we’re bringing one of them home with us! 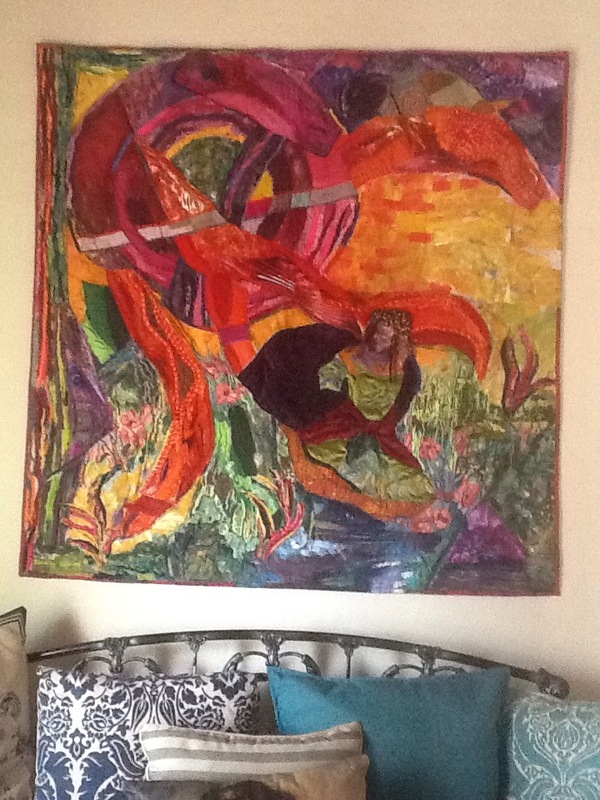 This is just one of many gorgeous examples, this one hanging in our bedroom called Burning Desire. And second that my cousin Belinda – who I last saw when we were literally children – actually lives in (or more correctly) on a farm remotely near Clanwilliam. Thanks to the wonders of Facebook, we not only connected but arranged for what Peter and I expected would be a quick drop-in for a coffee and hello before we headed on to our next destination. But most of all, I really loved reconnecting and talking about our mutual grandparents, and family members in general (though I have to admit a small problem on my part keeping track of which “Oupa” was which!) A fantastic catchup… and not without its drama, when as we were about to leave, Peter discovered he’d dropped his cellphone somewhere out there on the farm. Willie and son Brendan sprang into action heading in different directions to search – found in the cave, where we crawled through the rocks! Many “baie dankies” to you all! It was SO lovely to catch up we may even return one day soon! And thank you to you and to all the warm, kind Afrikaner folk we met along the way who reminded me so much of my childhood! This part of the world is truly your place, as it has been for generations, and it is wonderful to be reminded that in some places at least in this rainbow nation, there are good people just getting on with their lives in mutual harmony. Kingdom of knick knackery!! Ha ha. But yes NW Cape is still in the 60’s or 70’s in the best possible way. And the home industries are sooo yummy. Hi Debra and Peter will you be coming to Cape Town? If so and you have time, it would be great to see you!